Printing is the least popular digital photography activity today. We capture a lot of digital photographs, we process a large number of them and we post many images on our websites, blogs and social media pages. Unfortunately we print a very small number of these images. As I wrote in my previous essay, Printing and Traditions, making prints in the digital age is far from being what it was in the chemical age. This is in large part because we do not need to print a photograph to see it. It is available in digital format and for many this is enough. However a print is far more than an image viewed on a digital screen. It has a physical life and a beauty of its own. It exists by itself and does not require a technological device to be seen. It can be signed, mounted, matted, framed and displayed. It can be sold if you are in the business of selling your work. All this to say that a print is the logical conclusion of the image creation process. This is the way it was with chemical photography and this is the way I continue to see it today with digital photography. The device that makes an image on screen become a print on paper is the inkjet printer. As such printers are just as important as the cameras, lenses, computers and all the other gear and consumables that we use. They are just less popular. 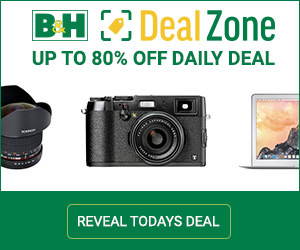 In fact, while all photographers own cameras, lenses, computers, digital devices and all sort of other gear, not all of them own a printer, or at least not a photo-quality printer. Of those that have one some are purchased but left in the shipping box, unopened and uninstalled, while others sit unused for months or years, covered in dust with dried-out print heads. The first step to printing your work is owning a photo quality printer. The goal of this essay is to help you acquire one if you do not have one yet or replace your current printer if it is outdated or non-functional. The purpose of this essay is two fold. First, to introduce and go over the main features of the Epson SC-P600. Second, to go over which features to look for when selecting a photo-quality printer. In the previous essays we studied how to print from Lightroom and we then took a look at my favorite printing papers. It makes sense we now take a close look at the printer I have been using when writing these essays and that is the Epson SC-P600. The Epson SC-P600 has been available for a number of years so the question can be asked: why review it now? There are several reasons why. First, this essay is not a ‘new product review’. I normally do not review products and if I do it is in the context of an essay on the subject of landscape photography. Second, this is Epson’s entry price photo quality printer and as such many photographers own it. Third, it can create fine art quality prints on a variety of substrates from glossy polyester to Baryta to cotton fiber. Fourth, it is the logical continuation of my essay on printing. Fifth and finally, it is a great printer featuring the current printing technology and this justifies reviewing it regardless of how long it has been available. The main features of the Epson SC-P600. So what makes a good printer? This section and the following ones aim at answering this question by going over the most desirable features of a photo-quality printer. Something I appreciate and find useful is the communication between the printer and the user. 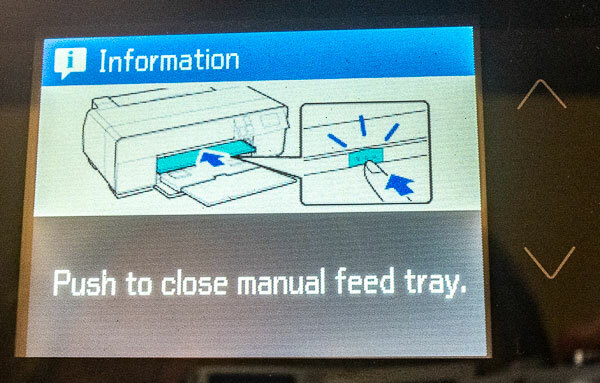 Epson made a lot of progress in that regard compared to the way their earlier printers communicated with the user. 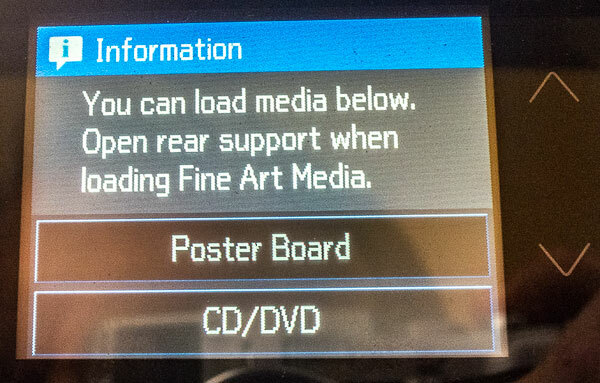 Now nearly all the steps the printer takes are clearly stated through visual messages on the LCD panel. A sample of these messages is shown on the photographs below. The P600 keeps you informed about what it is doing step by step through detailed screen messages, and this for most printer operations. 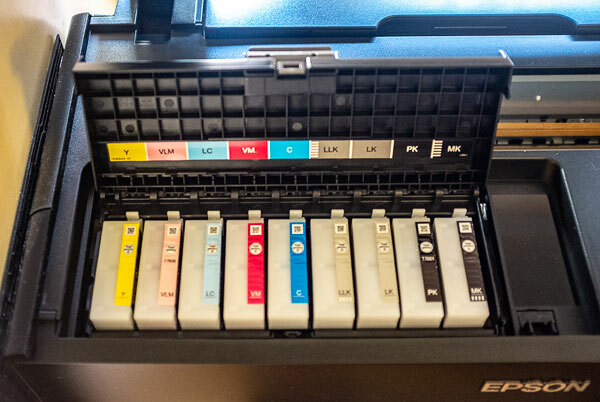 The size and the number of ink cartridges is an important aspect of a good printer. In regards to the P600 the cartridge size is relatively small, being only 26 ml. This is one of the shortcomings of a small printer. Large ink cartridges usually come in large printers, meaning printers able to print on large sheets or on wide rolls of paper. For example the P800, the ‘big brother’ of the P600, uses 80 ml instead of 26 ml cartridges. This is because it can print larger photographs, up to 17” wide instead of 13” wide for the P600. While still far from the cartridge size of wide format printers, which can be 500 ml or larger, this is already an improvement. Large cartridges, while being more expensive, save you money in the long run because the increase in cost is not proportional to the volume of ink. For example P800 cartridges contain over three times more ink than P600 cartridges but are less than twice the cost. 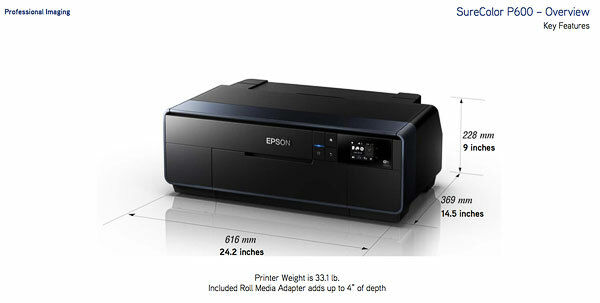 Both printers use Epson HD Ultra chrome ink cartridges in 9 different colors. 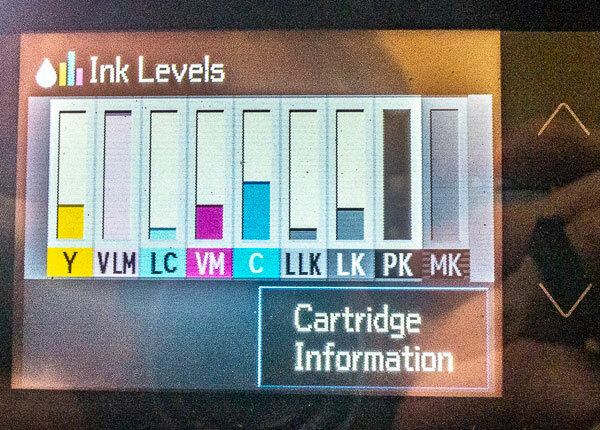 This is important because the more cartridges a printer has the larger the color gamut it can reproduce. In that respect there is no difference between the P600 and P800. Both are able to reproduce the large color gamut required for printing fine art photographs. One aspect that defines a ‘good’ printer for me is whether the print head dries out or not when the printer is not being used. I live in Arizona where moisture level for most of the year is 20% or lower, so drying ink is a real concern. Of course I understand that all ink will eventually dry if the printer is left unused for long periods of time and that some amount of clogging is to be expected. However not all printers clog the same way and not all printers clear clogs in the same amount of time. I have had printers that required half a day, if not a full day, and multiple cleaning cycles to clear a head clog, wasting large amount of ink and time in the process. The P600 is stellar in regards to this problem. After using the printer for over a year I have not had a print head clog that did not clear after a single cleaning cycle. Better still, on a number of occasions I did not have a print head clog at all even after not using the printer for several days or even a week. I do a print head test before any printing session. This is a requirement, not an option. You definitely want to find out on a test whether your print head is clogged or not and not on a fine art print! However what I am saying here is that after this initial test on many occasions there was no need to clean the print head. This is very good news because it saves time and money, both valuable resources which I would rather use to create prints than to clean dried ink. The ability to print on a variety of different papers (or substrates) is an important aspect of a good printer. 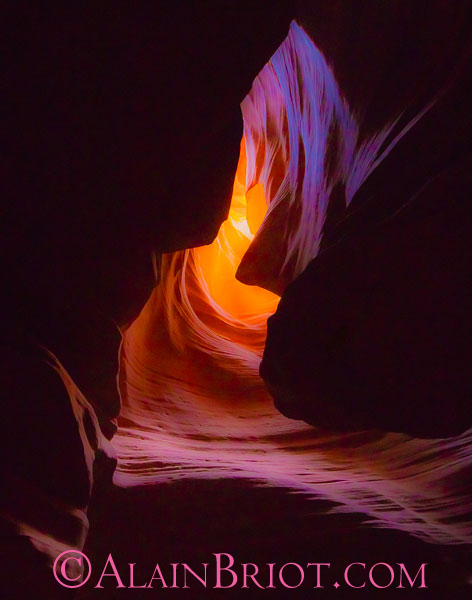 As fine art photographers we enjoy using different types of papers depending on the images we print, from glossy paper to luster, watercolor, etching, baryta even bamboo or other exotic surfaces, either in sheets or in rolls. The Epson P600 and P800 shine in that regard being able to accommodate just about any type of paper. Both provide three paper paths: a roll paper option for paper rolls, a straight-down sheet-feeder option for regular weight papers and a front feeder option for heavy papers. 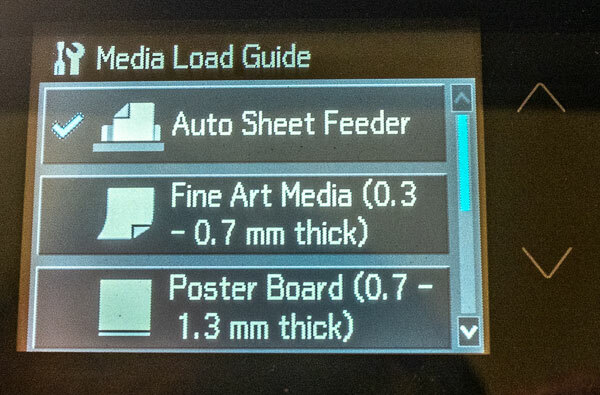 One thing to keep in mind is that when printing on heavy fiber papers you will need to set the printer to the front feeder option to see the selection options. This is required for papers such as Epson Legacy Fiber and Epson Legacy Etching. 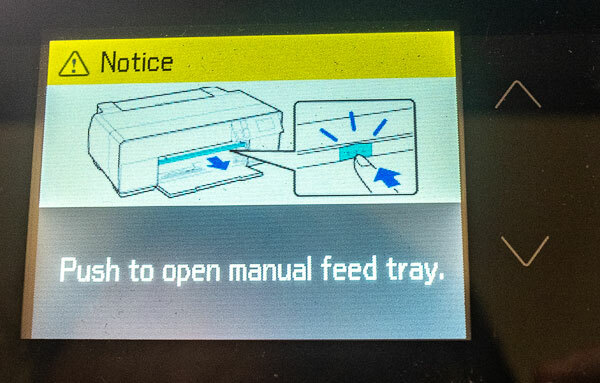 If you leave the printer set to the top feeder option you will not be able to select fiber papers in the printer driver. 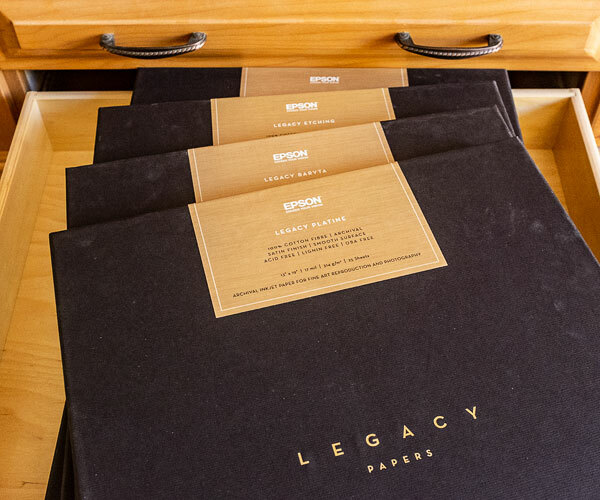 The Epson Legacy paper collection. One of many options for fine art papers. The P600/800 are great little printers offered at an affordable price point. However, compared to pro-level printers, are important features missing compared to those found in professional-level printers? The answer is both yes and no. Some pro-level features are missing while others are present. This is a pleasant surprise given the price point of these printers. Being able to align the print head so that all the ink jets, and therefore all the ink colors, print in line with each other is a very important aspect of a pro printer. The P600/800 print driver does offer this necessary feature and in that respect performs just as well as a pro-level printer. Without it the chances that your print head is aligned at the factory is virtually non-existent. As a case in point, when I did this test I had to correct some of the colors by +5 a number that seems extremely high but that was the necessary correction in that instance. A pro level printer can print at high resolution. So how does the P600/800 perform in that regard? Very well indeed. Both can print at 5760 dpi for photo quality printing in either regular speed or high-speed, meaning that the print head prints in both directions, on the way out and on the way back to the ink pad side when set to high speed printing and in one direction when set to regular speed printing. Here too, the P600/800 performs just as well as pro-level printers. Large format professional printers are big and heavy. The P600 is small, being only 25 inches wide. This means it fits easily on a desk or a shelf. Pro printers are much larger and roll printers, either 24 or 40” wide, require prime office real estate. This can be a problem if you only have limited space. The P600 is also lightweight being only 35 lbs. While this may seem like a lot it is not. Pro-level 17” wide printers are much heavier, requiring a standalone cart or desk to support their weight. To me the small size and lightweight aspects of the P600 are a plus. Even though I have a large office I also have multiple printers and finding room for one more is a challenge. Not so with the P600. I fit snugly on a shelf next to one of my desktop towers. If you don’t have much space or unwilling to purchase furniture to hold your printer, the P600 will help solve the problem of ‘where to put it’. A missing feature of the P600 is the waste ink tank. While all printers have one (this is where waste ink goes when you clean the print head) some waste ink tanks are replaceable while others are not. On the P600 it is not replaceable or serviceable. This means that when the waste ink tank full the printer is out of commission unless you can find a way to extract the goop out of the tank and then reset the printer counter so that the printer believes the ink tank is empty…not an easy feat. 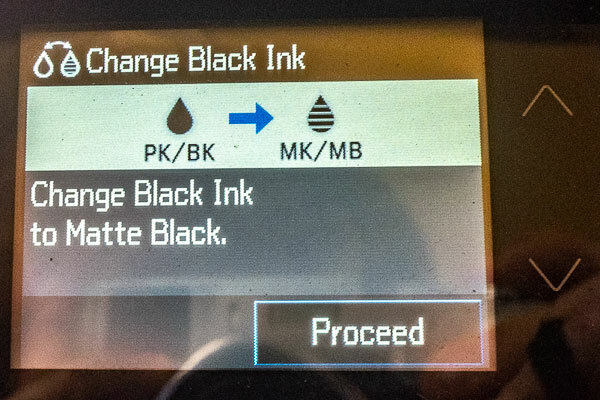 Fortunately it takes a long time to fill up an ink waste tank although this depends on how much printing you do. The P800 on the other hand does have a waste ink tank making it a more pro-featured printer in that respect by increasing its potential life span. Finally there is the issue of longevity. Pro level printers tend to be big and heavy indicating that lots of metal parts, or heavy plastic, are used. This gives them solidity and longevity. The P600/800 are lightweight in comparison indicating a more ‘flimsy’ construction. So far nothing indicates these printers will break down but if logic prevails it would seem that they are not going to last as long as a pro printer. Only time will tell and it remains to be seen whether this goes one way or the other. I have had numerous inexpensive office printers and although they are lightweight and built with thin plastic they last forever. In fact the main problem with such printers is not their construction but the ridiculously small ink cartridges that need to be replaced on a near-constant basis. Not just the black cartridge mind you but all of them even though I rarely print office documents in color. A good printer is one that you can afford, have room for in your work space and does not require constant maintenance. In short, a good printer is one that is easy to own and use, one you make lots of prints on. 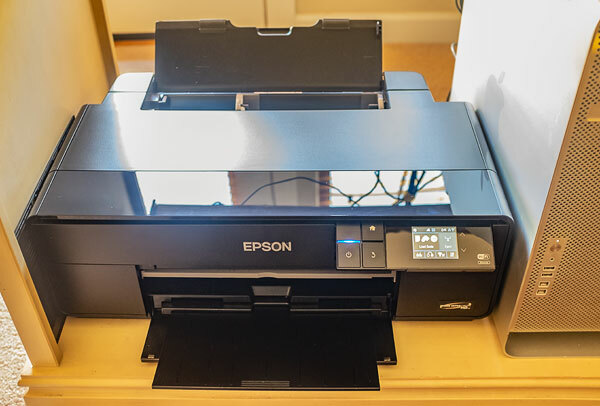 The Epson SC-P600 fits the bill being an inexpensive, practical and versatile printer. It allows you to print on a variety of substrates and offers several pro-level features. So is the P800 which shares all the features of the P600 with the addition of larger ink cartridges, a waste ink tank and the ability to make 17” wide prints. Whether you can or cannot live with the limitations I described above is a question only you can answer. However money has a way of helping a great deal in those matters. A missing feature has to be counter-balanced with how much money is saved by not having this feature. 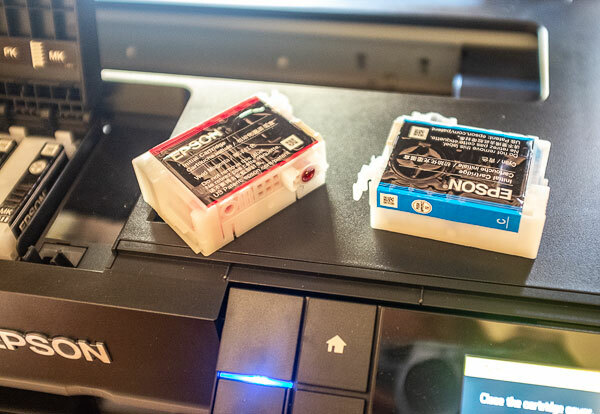 In the instance of the P600 the most important missing features are not having an ink waste tank and the printer potentially having a shortened lifespan. I say “potentially’ because only time will tell. However you save hundreds, if not thousands of dollars (depending on printer model and size) when you purchase the P600/800 versus a pro-level printer. 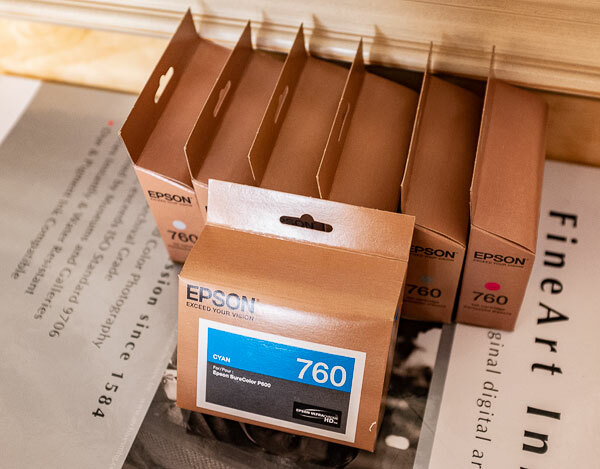 Furthermore, if you do not have a printer yet, or if you use an outdated printer or one that is not able to create photo-quality prints, purchasing the P600/800 will get you ‘in the game’ so to speak. Eventually that is the most important. Fine art photography does not end when you make a print. It starts when you make a print! I create fine art photographs. Before that I studied painting and drawings at the Academie des Beaux Arts in Paris. I have published four books and over 500 essays in many different publications, both analog and digital. Besides creating fine art photographs I enjoy landscaping, attending cooking classes, driving sports cars and restoring bicycles. Bianchi, De Rosa and ParkPre are among my favorites together with anything Campagnolo. I like Italian bicycles, bicycle components and cars. It has a lot to do with the passion that the artists and engineers place in the design of their creations. I also like wearing handmade leather driving gloves and converse shoes. My books, Mastering Landscape Photography, Mastering Photographic Composition, Creativity and Personal Style, Marketing Fine Art Photography and How Photographs are Sold are available in eBook format on our website at this link: http://beautiful-landscape.com/Ebooks-Books-1-2-3.html. Free samplers are available. If you enjoy my essays you will enjoy attending one of the workshops Natalie and I teach together. There is a lot more to photography than reading about it. Nothing replaces being in the field, admiring the light, composing images, creating art, experiencing incredible locations at the best time with the best light. 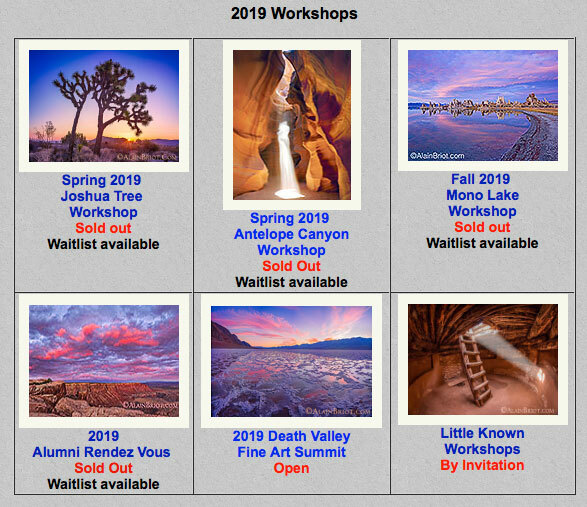 Great landscapes, great companionship, like-minded participants and learning about how to improve your work by finding out what works and what you need to improve upon, all combined to create unique events that will change how you approach fine art photography and will show you how to take the next step with your work.